Why do we use Resistive Touch Screens? Posted on March 10, 2011 at 10:25. At Hope Industrial we have always used resistive sensors in our industrial touch screens. Specifically, we use 5-wire AccuTouch Resistive Touchscreens from Elo Touchsystems. Resistive touch screens are made of at least two layers of flexible sheet (polycarbonate, in our case) laid atop a glass substrate. The sheets are coated with a resistive substance and are kept separated by tiny dots. When the touch screen is pressed, the flexible layers are pushed together, generating a change in resistance on both vertical and horizontal axis. This change in resistance is measured by sensors on the edges of the screen and the degree of change is measured as a touch point. Of course there are a variety of different touch technologies out there: Surface Acoustic Wave (SAW), Capacitive, Infrared, etc. Interesting stuff, but the point of this post is not to compare and contrast these technologies (Wikipedia does a great job of that already), but to explain why we chose 5-wire resistive, and why we use Elo products specifically. First a basic requirement, we manufacture waterproof LCD monitors for industrial applications – so whatever we use has to be waterproof. Resistive sensors easily meet NEMA 12/4/4X and IP65/66 standards for environmental exposure, and are easily sealed in the bezel of an industrial display. Optical technologies, like infrared, are not so easily sealed and can be susceptible to malfunction in extremely dirty environments. Some acoustic-based technologies can also have trouble when bonded to an enclosure for sealing, especial if the bonding changes the acoustic properties of the glass. Resistive touch screens are also purely pressure-sensitive, meaning that anything that presses against the sensor surface will register a touch. One obvious advantage is that a user can use a stylus made of most any material – very useful when high precision touch is needed and the fingertip is simply too big. A less obvious advantage is the ability to operate the screen with a gloved hand. Most capacitive touch screens will not work with heavy gloves since the screen actually detects the electrical properties of your finger. 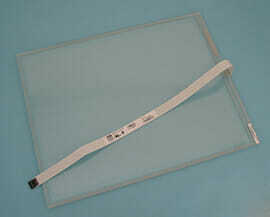 Resistive screens have no problems here – a user in heavy protective gloves can easily use our screens. Give that a try with your capacitive touch screen-equipped-iPhone! Many food and beverage industry facilities have extremely strict “no exposed glass” policies, and for good reason; it’s simply not an option for a piece of glass to chip off of an industrial touch screen and into some customer’s microwavable dinner! Most touch screen technologies fail in this area by using raw plate glass as the outer touch layer. Resistive does not: Elo AccuTouch sensors use a very strong polycarbonate outer layer that incorporates an acrylic hardcoat to improve scratch resistance. We bond this layer to our industrial display bezels, which means that even with an extreme frontal impact that entirely shatters the touch sensor substrate and even the LCD, all glass is contained and cannot be released into the environment. For many of our customers, this is a zero-compromise requirement that resistive technology easily addresses. Elo Touchsystems is a leader in the touch sensor business, and integrating their touch sensors has benefits beyond the inherent strengths of resistive technology. The sensors themselves are the highest quality, with stable drift-free operation and calibration that can last the life of the product. The Elo AccuTouch controller itself comes with an extremely broad base of driver support. Elo provides drivers for Windows Operating Systems that are constantly updated with the latest features, including 25-point high accuracy calibration and full support for Windows 7 single-touch gestures. More importantly, Elo supports a very wide variety of OS’s. Linux users will appreciate not only a standard driver that can be compiled into most builds, but a variety of pre-compiled drivers for more common distributions. Support for Elo AccuTouch is also almost ubiquitous in common thin clients and other custom computing devices. Many leading vendors, including Wyse and HP, include support for Elo AccuTouch controllers right out of the box. The outer polycarbonate outer layer of our touchscreen sensors is a benefit which gives it an edge over many other all-glass touchscreen technologies, but in rare cases this material can present a problem. Occasionally we will receive a screen from a customer where a user has decided to use a box cutter as a stylus, which can cause a failure if liquid is allowed into the screen via the cut membrane. For users in environments where this is a possibility, we have two options: first, we carry a line of industrial touch screen screen protectors that are made of the same material as the touch sensors themselves and include a transparent adhesive. We originally designed these to protect displays in the worst possible environments, but have found that some users use these low-cost coverings as a way to clean the screens: every few weeks they will just peel off the old protector and apply a new one. Also, we have several customers who want many of the benefits of a resistive touch screen, but need an entirely scratch-proof outer surface. In these cases, we can custom fit a touch screen sensor from AD Metro. This company produces armored resistive touch screen sensors, which actually use a thin layer of glass in the outside layer. These sensors are quite strong and the glass outer layer gives them a high degree of resistance to scratches and cuts, which works well in some industrial environments. We buy your touch screens (19″)from many years and we mount them in a pressurized enclosure with a max pressure of 1 inch of water. Why sometime we found that the touch screen membrane swells ? Is there a solution to prevent that ? Thanks for posting – we actually made a product change earlier this year that should solve this problem for you. The touch screen sensors we use have a tiny vent hole that allows air to pass between the outer membrane and the glass substrate. This vent is used in the manufacturing process but serves no purpose in the normal operation of the sensor. Starting earlier this year, we are sealing these vent holes which prevents the enclosure purge pressure from forcing air through the vent and swelling the touch screen surface. We would be happy to retroactively apply this fix to any of you current screens you would care to send us – just drop us a note at support@hopeindustrial.com and we can get the process started. I am looking for a touch screen which can work underwater(40m or more). Do you think there has any touch screen can make it? Thanks. Unfortunately I’m not aware of any touch screen technology specifically designed for use at those sorts of depth and pressure. I would imagine that it would not be resistive (pressure sensitive and relies on an air gap/cavity) or capacitive (would be affected by capacitance of water unless controller was smart enough to change tolerance when submerged). Perhaps a light-based (either infra-red or some sort of shadow-detecting) technology could be adapted, but this would truly be an extreme and niche application – overcoming the physical PSI exerted on the surface of a large screen alone would require an extremely strong touch screen substrate. I’m sorry I could not be more help.